Clean your machine in two simple steps for better tasting coffee! 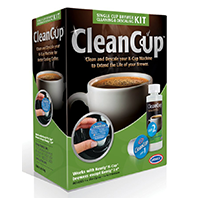 The CleanCup kit comes with one cleaning cup and a 4 oz. bottle of descaling liquid. Everything you need for one cleaning of a K-Cup brewer.